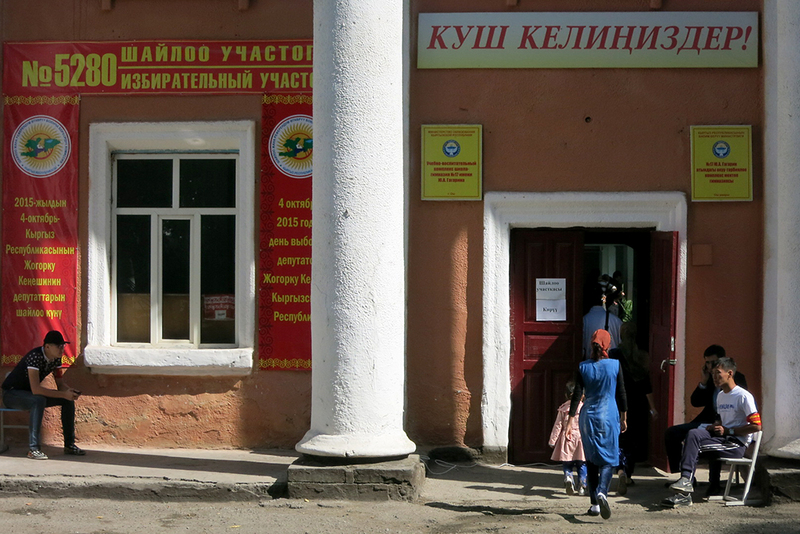 Kyrgyzstan has held a parliamentary election like no other in Central Asia. Competitive and technological, the October 4 vote set a bold example that has been hailed by organizers as a historic turning point for the nation. All the same, the election is broadly expected to return a mandate for continuity that some fear may leave the country unprepared for troubles ahead. As no public opinion polls were allowed ahead of the vote, political observers had to rely on hunches and guesswork to determine the respective chances of the 14 parties in the running. There appeared little doubt that the Social Democratic Party (SDPK), which is inextricably associated with its former leader, President Almazbek Atambayev, would secure a dominant role in the 120-member parliament. The only uncertainty was how close SDPK would get to the 65-seat maximum allowed by law and how many other parties could get their deputies into the legislature. SDPK’s top rivals include Respublika-Ata Jurt, a hybrid business-nationalist party, the left-leaning Ata-Meken and the self-styled technocratic Bir Bol party. Speaking after casting his ballot, Atambayev said that the fewer parties that enter parliament the better. “So that the government doesn’t change every year, it would be preferable for there to be no more than three parties,” he told reporters. Turnout figures appeared to suggest participation at this vote was lower than in previous elections. Election officials said that by 4 p.m. turnout had reached out 37.9 percent, which was a substantially more modest number for the same time at previous elections in Kyrgyzstan. “Now we are using new technologies, these are more or less fair elections, so it seems. There are no carousels, there is no more corralling people (to the polling stations),” election commission member Zharkyn Bapanova said. SDPK’s opponents maintain that it has benefitted from favorable coverage in state media and that other parties have been unfairly targeted by smears in reports by government-controlled television stations. Once such episode happened on September 26, when a live prime-time election debate on a state broadcaster was followed by a report accusing SPDK rivals of trying to buy votes. The primary targets for criticism in that report were Ata-Meken, Bir Bol and Respublika-Ata Jurt. In Osh, in southern Kyrgyzstan, voting proceeded calmly in an election viewed by many inhabitants as a test of stability for their troubled city, the scene of deadly ethnic clashes between the Kyrgyz and Uzbek communities in 2010. Stability was the buzzword on the lips of many voters, mindful of the need to preserve the fragile peace between the communities that prevails five years after violence that left 470 people dead. Uzbek voters overwhelmingly said they had cast their ballots for the SDPK. “We voted for our future,” said her companion and fellow SDPK voter Rakhima Umirzakova told EurasiaNet.org. Like many Uzbek voters, they view Atambayev as the guarantor of the security of the Uzbek community in a country that has experienced an upsurge in nationalist rhetoric in recent years – but many Kyrgyz voters also said they were supporting the SDPK in the interests of stability. “It’s the president’s party and it pursues a peaceful policy,” said businessman Bakhtiyar Samidinov after casting his vote at a polling station at Osh State University. But where some see stability, others worry about stagnation and the dangers of disillusionment in political elites that many perceive as primarily working in its own interests. International Crisis Group said in a report published on the eve of the election that inability to tackle persisting ethnic tensions, corruption, unchecked nationalism and the surge of political Islam could lead to unrest that would the entire region at risk. Nationalist parties, such as Respublika-Ata Jurt party and Ata-Meken, looked set to make strong showings in Osh, with voters professing support for their hardline positions on law and order and corruption rather than their nationalist leanings. Many voters expressed doubt that the new parliament that will be formed after the election will be able to resolve the pressing problems they want political representatives to tackle, from creating jobs to tackling rampant corruption – but not everyone is tired of democracy. Roza Otunbayeva, who served as interim president for several months after the 2010 revolution, told EurasiaNet.org that she understood that Kyrgyzstan still has progress to make, but that the parliamentary election marked a significant improvement on earlier votes. Joanna Lillis is a freelance writer who specializes in Central Asia. Peter Leonard is EurasiaNet's Central Asia editor.